Andrew Markley was in his lab during graduate school at the University of California-San Diego when he started to consider the waste generation aspects of his research efforts. “Why are we throwing away all of these Styrofoam boxes?” wondered Markley. This simple line of inquiry prompted a one-man mission to change the relationship between Styrofoam (also known as expanded polystyrene or EPS) and research science. Motivated as he was, but with no sure footing to start, Markley started attending local sustainability meetings for Biotech Professionals in San Diego. There he met the CEO of a startup biotech company looking to decrease the environmental impact of his product shipments. To supply this company with reused boxes, Andrew mobilized researchers in his building to collect these boxes for pickup and reuse by this biotech company for outbound shipments. Everything went smoothly until his graduation in 2011, at which point the program – without Andrew’s leadership - unfortunately withered on the vine. After settling in at his post-doc at the University of Wisconsin-Madison, Andrew encountered the same problem in his new lab: too much wasted EPS. Working with the director of the Office of Sustainability– who was excited about the idea of reducing this waste stream – Markley entered, and won, the EPA P3 (People, Prosperity, and Planet) Extramural Design Grant in the 2012-2013 school year. Working with the We Conserve, a campus organization dedicated to increasing recycling on campus, Andrew led a team that started installing EPS collection sites inside of campus research buildings. .
By Summer 2014, Andrew’s program was collecting approximately 1,000 lbs of Styrofoam per month; that’s enough volume to fill a semi-truck. 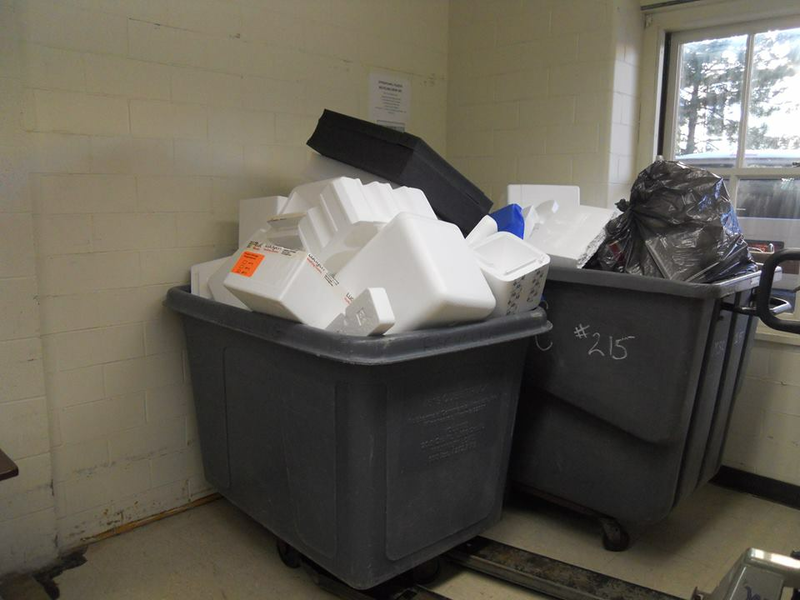 Not only was this program diverting ~4,000 cubic feet of Styrofoam from the landfill every month, but it was also generating money to help pay it’s undergraduate staff. This success convinced Andrew to expand. In 2014 he applied for, and won, a further $86,000 to help improve the recycling program at UW Madison. It enabled him to bring this program to two additional universities: Washington University at St Louis, and the University of Illinois Urbana-Champaign. The grant funding will help pay for Styrofoam densifiers which will allow the Universities to generate income, by selling their EPS waste to recyclers across the country. In this way, Andrew is helping to implement Styrofoam recycling and upcycling programs in three states in a manner that will hopefully become economically self-sufficient and sustainable, all while pursuing his own research in synthetic biology. He likes to quip that “No one is going to get rich off this”, but in the same breath is quick to identify a local manufacturer that will purchase the Styrofoam in order to produce some consumer goods. If this were recreated at just 50 Universities across the country, they would collectively divert more than 27 Olympic swimming pools worth of Styrofoam in single year. In order to ensure the process is accessible to all, he has created a free pdf outlining the steps necessary to implement this type of program in your lab (available here). Currently Andrew Markley is applying for a faculty position in microbiology. We’ll keep tabs on him and let you know what other amazing labconscious ideas he generates.